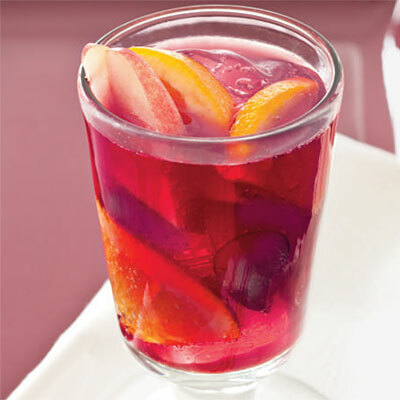 In keeping with the summer-y theme of last week's Thirsty Thursday, let's stir up some Sangria! The best part about this sip is it's totally customizable. The wine-based, punch-like drink can be made with white or red wine (heck, even a little bubbly if you're into that), and just about any kind of fruit. A personal favorite is white wine with peaches, oranges, and apples. Enjoy a glass or two during brunch on a warm, breezy afternoon to transport yourself to a zen oasis. Don't forget to grab the fruit at the end—the natural sweetness melds into the flavors from the wine, liquor, seltzer, or anything else you choose to mix in. This version is courtesy of Skinnygirl Bethenny Frankel, who really knows her stuff when it comes to cocktails that won't break the calorie-bank. It's made with red wine, three kinds of fruit, and soda for some added carbonation. The kicker though? It's only 173 calories a serving.